This is by far the easiest lautering technique I have tried! If you are thinking about going all grain this is by far the easiest way to do it. It's so clean! No transferring of hot wort. No tinkering with temperatures by calculating volumes to arrive at your saccharification temperature. During the three step mash it was a breeze to hit all my temperatures spot on. The bag was easy to make out of voile fabric. 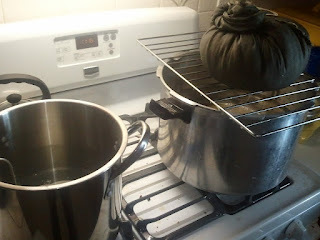 And if you don't know someone with a sewing machine, 5 gallon paint strainer bags work great. 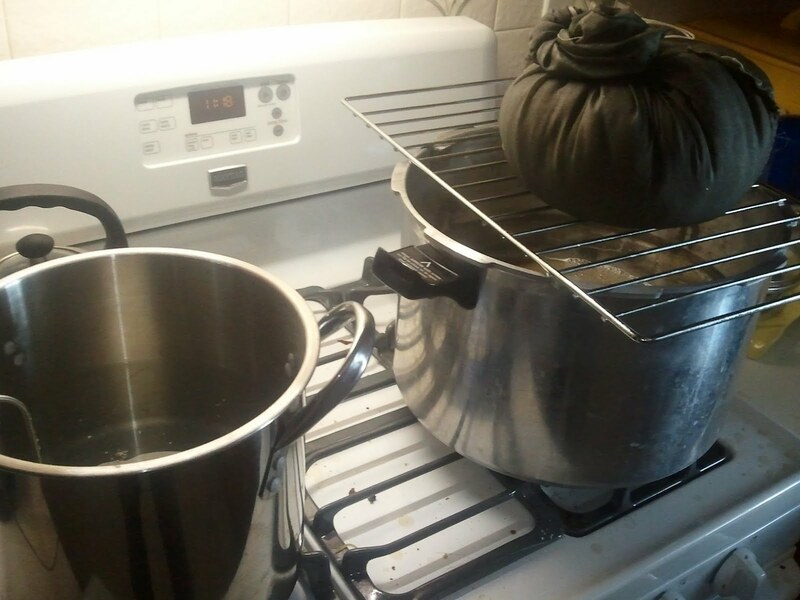 In this picture the bag has been twisted up to squeeze out the wort and set on a cooling rack to drip into a four gallon pot that serves as both the mash tun and the boiling kettle. The pot on the left was used for sparging. When the run off was nearly complete, after twisting the bag and squeezing it with a pot lid, The volume was measured and sparge water was added to make up the difference that will be needed for the boil volume. The brew bag was dipped into the pot, opened, and stirred to wash the remaining sugar off of all the grain. The end result? 74% efficiency. Not bad for the first time out of the gate! The biggest downside I see to this method is the volume that can be brewed. With a 4 gallon pot the most you can put in it is about 10lbs of grain in 10qts of water. So a five gallon stout recipe is simply not going to fit. You'll have to scale back your Guinness clone to 3 gallons or so. At 75% efficiency (which is normal for BIAB) and using 37 GP grain, that puts you at 277.5 Gravity points per gallon. So a three gallon batch the OG is 1.092, which is pretty good, but a five gallon batch is 1.056 which would yield a beer that is average in alcohol content. So for big beers, unless you don't mind a small batch, you're going to need to build yourself a cooler-tun.